For more than 30 years, Blendco has been demonstrating the convenience and cost effectiveness of powder to liquid formulations with the patented SuperSat Custom Detergent System. SuperSat detergents have proven formulations for cleaning power, fragrance and color. The SuperSat System make a full range of detergents continuously and automatically at your wash. No other system can compare to SuperSat, the powder system standard. 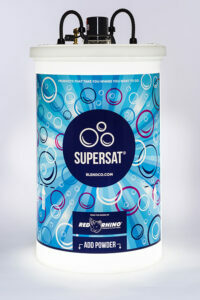 The SuperSat tank provides a continuous supply of alkaline builder solutions. An alkaline builder delivers strength and cleaning power to the final detergent. As the solution in the tank is used, new solution is generated automatically using your water and the powder reserved in the bottom of the tank. With Supersat, absolutely no mixing or measuring is ever required!